No doubt my favorite truck. My first food truck rodeo was not so great. Well, the food I was able to get was fabulous, but the long lines, the heat, the crowds —ugh it was a disaster. The next was drizzly but not so bad since that meant the lines were shorter. I’ve heard a lot of people complain that these types of rodeos aren’t worth it. And I counter with, “But did you have a plan?” Usually the answer is we went to have lunch but could eat at only about two trucks before getting full and tired. This is why a plan is of the utmost importance. I’m telling you. Do not attempt a food truck rodeo without a solid plan. Wandering from truck to truck trying to figure out what you want is just going to make you frustrated. And you don’t want to be frustrated and hungry and end up standing in a long line. So I came up with this roadmap for conquering Downtown Food Truck Rodeo even in the heat of summer. 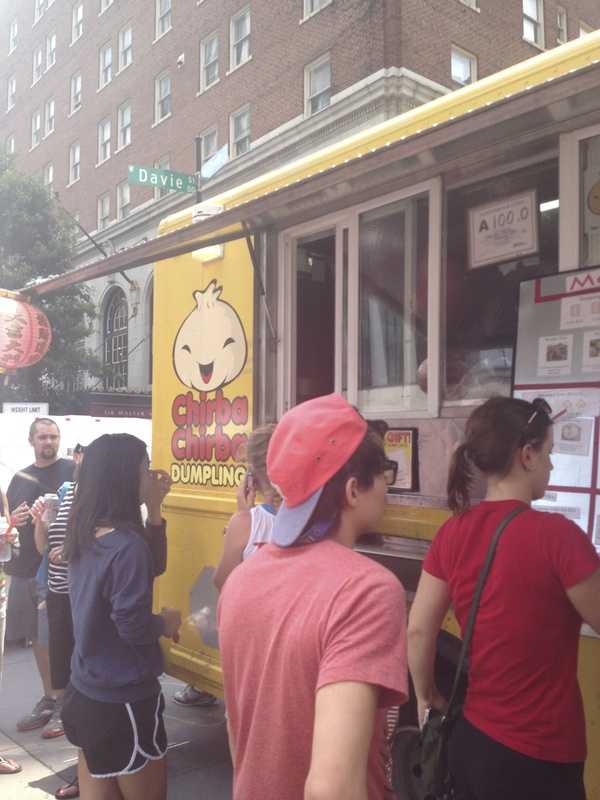 It may even been an effective plan for a food truck rodeo in your city, too. I really can’t say this enough. Have a game plan before you step foot out your door. 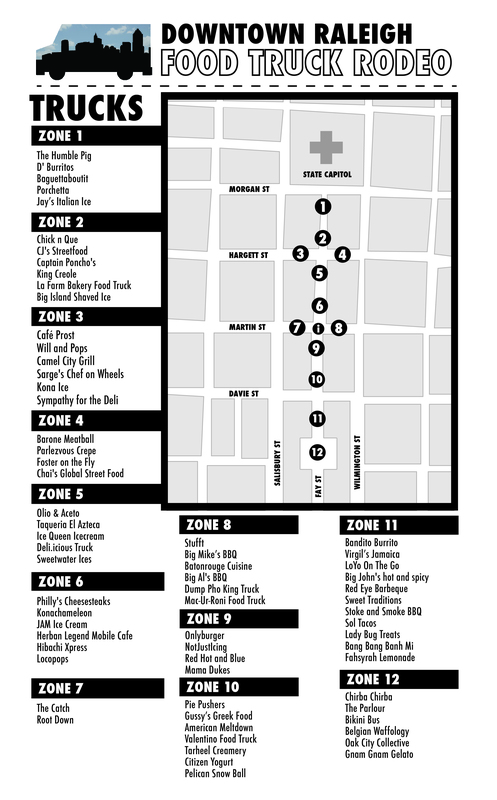 The nice thing about the Downtown Raleigh one is they give you a nice map that’s great on a smartphone. Jump on the website and find out what trucks will be there and what food is on their menus. Eat before you leave if you plan on just grabbing a bunch of different things from several trucks to bring home. If you plan to eat at the event, eat a light snack. Just enough to hold you through your first two lines. Figure out if there is a certain food you want to eat. The last rodeo I did all Asian food. Next time I might go all North Cackalakey and do BBQ. Or maybe I’ll just do all desserts. Haven’t done desserts yet. Watch the weather and prepare accordingly. If it’s going to be a 90-degree day wear a sun hat (or umbrella), sun screen, and wear light clothing. Comfy footwear is a must. If it’s rainy, don’t stay home. That might be the best time to go because the crowds will be lighter. A raincoat and a hat should do it. Bonus points if you have cute rain boots and a waterproof lunch bag/cooler. Picnic bag. Mine came with utensils and plates for four. The bag is insulated for hot or cold food. 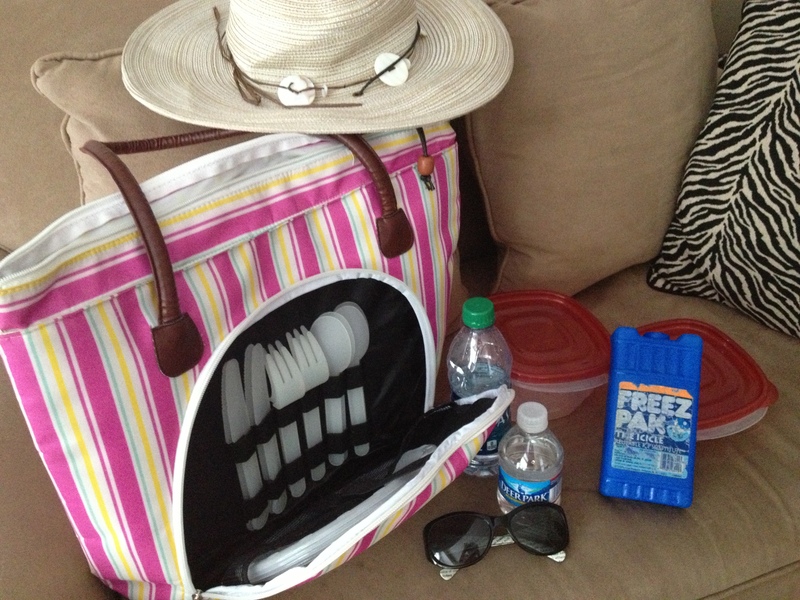 Having the extra small cooler (not shown in pic) helps me keep my hot food and frozen or cold items separate. Divide and conquer is the theory here. Each of you can stand on a different line, grabbing stuff for the group. Text each other if something is not available that someone wanted. Tell them what is the substitute. With three people you could possibly hit three truck a piece. But they need to be equipped with the essentials, too, to make it worth everyone’s while. I can’t give up all my secrets. But here’s a tip. Arrive 1 hour to 30 minutes early. If you know where the first zone you need to get to is, park as close to it as you can on a side street or parking deck. In the end with a good plan you can end up as satisfied as I was with this haul. And this wasn’t even all of it! A dazzling amount of choices! The next one I go to, I need to take advantage of that. I have my favorites now so I have to make room to make new favorites! The buns are so addictive. The dumplings are, too!